Published: March 19, 2013 at 09:44 a.m. Updated: March 19, 2013 at 03:42 p.m.
PHOENIX -- Among the issues to be discussed on Tuesday at the NFL Annual Meeting in Phoenix is the future of the Pro Bowl. 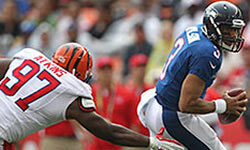 Check out the best photos from the 2013 Pro Bowl in Honolulu, Hawaii . While the expectation is that the game will be held in Hawaii next year, the league also will look at and discuss ways the actual teams are assembled. One intriguing option sure to be thoroughly examined is holding a draft as a way to divide up the teams. Details are not yet available on how the process would play out, but one possibility would be for player captains to choose teams as if on a schoolyard. Up until now, teams were separated by conference. On Monday, NFL Commissioner Roger Goodell expressed optimism about the game's future.